Early collaboration between the Canadian pharmaceutical company, Ayerst, McKenna & Harrison, Ltd., and Dr. J.B. Collip, Ph.D., a pioneer in endocrinology research at McGill University, Montreal, led to the 1930 discovery of Emmenin, the first orally active (water-soluble) estrogen. Before this conjugated human estrogens product, the only estrogen therapy available was human steroids, which had to be administered by injection. Emmenin was made by extracting the conjugated estrogens obtained from the late pregnancy urine of Canadian women. Within a short time after the introduction of Emmenin, it became clear there was a need for a lower cost, more potent estrogen than Emmenin. Consequently, researchers began looking for potential mammalian sources. Researchers in Germany studied the urine of all mammals in the Berlin zoo and reported that the urine of pregnant equines (zebras and horses) included significant quantities of potent, water-soluble, conjugated estrogens. In 1939, Ayerst made a breakthrough in the process of extracting estrogens from mares’ urine. Through this complex process a very active and stable urine concentrate was obtained. Since the potential supply of pregnant mares’ urine PMU far exceeded the available supply of urine from humans, and its potency was at least two and a half times that of human urine, Ayerst scientists enthusiastically set to work on the development of a product from this source. After two years of work, Premarin was ready to be marketed in Canada in 1941. The following year it was approved for use in the United States. In 1943, the American Home Products Corporation (AHPC) purchased Ayerst, McKenna & Harrison, Ltd., later shortening the name to Ayerst Laboratories and subsequently merging it with Philadelphia-based Wyeth Laboratories in 1987. 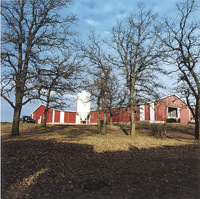 Wyeth was acquired by Pfizer in 2009. Initially, the company contracted farmers in rural Quebec, near their manufacturing plant in Montreal. As Premarin use increased, additional ranchers were sought in Ontario, upstate New York and Vermont. However, in the late 1960s as it became more acceptable to openly discuss menopause and its associated problems, Premarin usage increased significantly. The company foresaw that it wouldn’t be able to contract with enough farmers to meet the growing demand. It was logical to look to the Canadian prairies where horse and pasture land were plentiful. 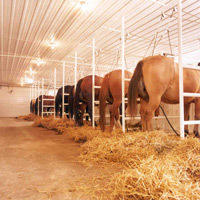 In the mid-60s, a decision was made to build a new processing plant in Brandon, Manitoba and consequently, equine ranching flourished in the Midwestern provinces of Alberta, Manitoba, and Saskatchewan, and the state of North Dakota. Between 2003 and 2005, Wyeth Pharmaceuticals undertook a network resizing due to a combination of factors including a reduction in demand for the products as a result of data from the Women’s Health Initiative (WHI), improvements in manufacturing and inventory management, and a shift to lower-doses. Consequently, the scope of the collection network was reduced, with ranches concentrated in Manitoba and Saskatchewan provinces in Canada and a small number of ranches in North Dakota. While other estrogen products are available, none have duplicated Premarin. The manufacturing process of Premarin is one of the most sophisticated in the pharmaceutical industry. No other company has been willing to devote the time, effort, and money necessary to produce an identical, high-quality product. The scientific evidence is clear; all estrogens are not the same. Physicians report that some women do better on one than another. However, it is important to point out that Premarin is the most widely studied estrogen replacement product in the world. More than 3,000 scientific studies of estrogen have used Premarin…studies that have helped health care providers to better understand the benefits and risks of estrogen replacement therapy. Today, conjugated equine estrogens in Premarin are taken by millions of postmenopausal women worldwide to relieve symptoms of estrogen deficiency.